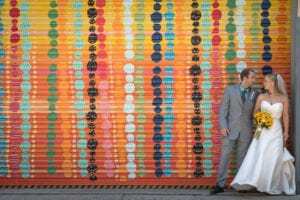 The Torpedo Factory Art Center provides a unique, industrial backdrop for your special event. 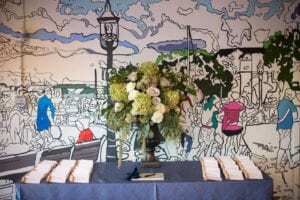 Located in the heart of quaint Old Town Alexandria, Virginia, the Art Center is a popular venue for receptions, weddings, parties, meetings, lectures, and performances. The art-filled interior public spaces in the Art Center, is surrounded by one-of-a-kind artwork and can be rented for private events in the evening hours when the Center is closed to visitors. Built in 1918 to manufacture torpedoes like the one displayed on the first floor, this striking three-story building retains its identity in daylight as a former factory with exposed pipes, ductwork, and smokestack. The walls and unusual mushroom shaped columns remain white. While new railings combine blue paint and steel, bright yellow lighting fixtures are industrial-style, and studio doors are painted in playful colors. The building includes a dramatic two-story atrium surrounded with a balcony and divided by two catwalks. These overlook the main hall which measures approximately 150-by-25-feet. 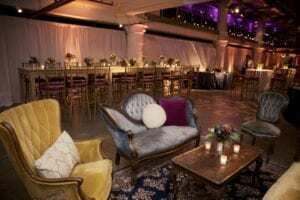 *Seated Capacities vary with event set-ups. 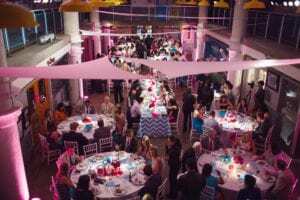 The Torpedo Factory Art Center has a preferred list of caterers but we are open to new caterers based on reviews. Dancing and amplified music are permitted. Guests may choose to use the parking garage directly across the street or other nearby lots. The entire building is accessible to persons with disabilities. Follow Torpedo Factory Art Center's board Rent the Torpedo Factory Art Center on Pinterest.